Title: 'Insula Albion et Hibernia'. Dutch text on verso. A very impressive Ptolemeaic map of the British Isles by Blaeu showing an early view of the cartographer's developing shape of the island. ALBION (England & Wales) take a sharp right angle turn at BRITANNIA (Southern Scotland), which is depicted as lying East to West. 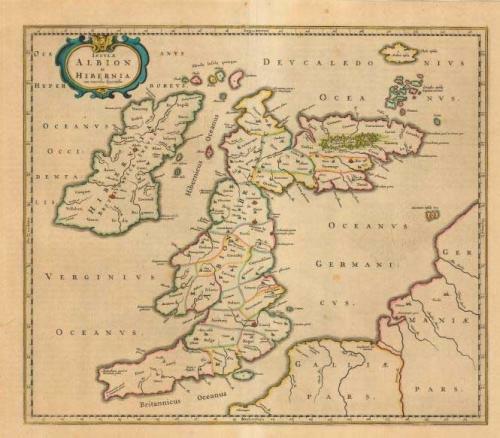 HIBERNIA (Ireland) lies in the Eastern Ocean (Atlantic). Britain is separated from France by the "British Ocean" and from Germany by the "German Ocean". LONDINIUM is the capital. The map has a dark impression with original colouring with wide margins. A few faint spots and mild toning, else very good condition. Ref: Van der Krogt (Atlantes) #5000H:2A.